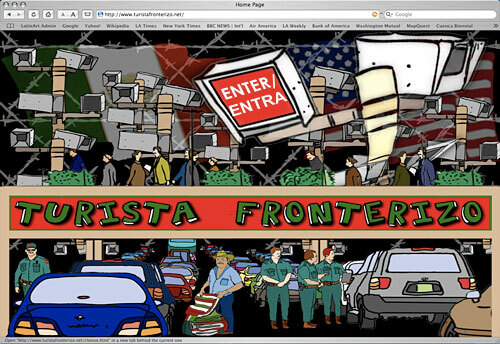 In 1998 Dominguez co-founded The Electronic Disturbance Theater (EDT), a group who developed Virtual-Sit-In technologies [a form of electronic civil disobedience] in solidarity with the Zapatista communities in Chiapas, Mexico (www.thing.net/~rdom). He was co-Director of The Thing (www.thing.net) an ISP [Internet Service Provider] for artists and activists (1996-2004), and former member of the Critical Art Ensemble (1986–1995). His performances have been presented in museums, galleries, theater festivals, hacker meetings, tactical media events around the world. His collaborations with Coco Fusco most recently include acting the role of an FBI agent in the video art project *A/K/A Mrs. George Gilbert* (2004) and also on the net.art project (turistafronterizo.net) for the inSite_05 (insite05.org). He also collaborated with artist Diane Ludin on (ibiology.net) which was presented at ISEA [Inter-Society for the Electronic Arts] (2004) and at the MadridMedia Lab. Other collaborations include (specflic.net) a speculative distributed cinema project with artist Adriene Jenik. Dominguez teaches at UCSD in the Visual Arts Department and is also a Principle Scientist at the new edge technology institute CAL IT(2) (www.calit2.net) where he will be researching and developing a performance project on nanotechnology entitled *b.a.n.g lab*. In this interview from 2011, curator Mathew Schum interviews Ricardo Dominguez about his cybernetic activist practices.